I would first like to focus on the film’s exploitation of narrative heterogeneity, examining several sequences which function outside of the structures of normative cinematic narration, before looking individually at anomalous instances of image, sound, and landscape throughout the film. 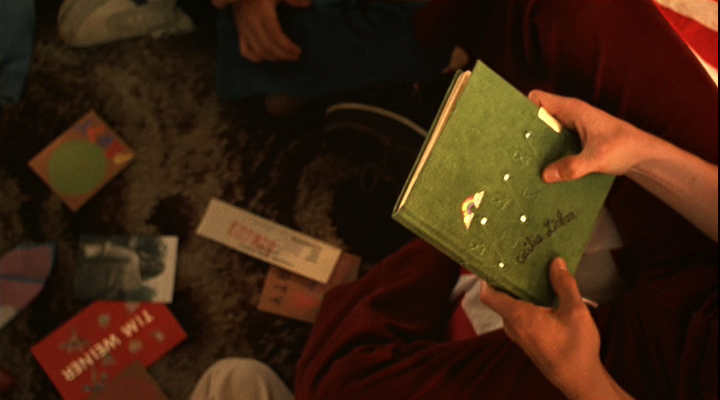 One of The Virgin Suicides’ most memorable sequences is that of the boys reading Cecilia’s diary, and its impact is largely derived from its foregrounding of the pictorial and acoustic elements of its composition. 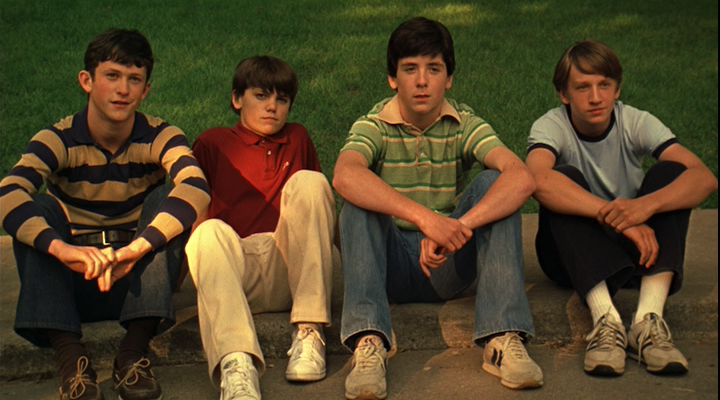 It is worth noting initially that although the film maintains the novel’s refusal to identify any one of the characters as the narrator, it does align itself with four boys in particular, frequently framing them together in shots which depict them in a state of shared spectatorship (as in the second and final scenes of the film). Those four are Chase Buell (Anthony DeSimone), Tim Weiner (Jonathan Tucker), Parkie Denton (Noah Shebib), and David Barker (Lee Kagan), and although the film absorbs the perspectives of multiple characters into its collective narration (most notably that of Trip Fontaine [Josh Hartnett], which we will consider later), some combination of these four is present throughout most of the film, with the entire quartet present for the most significant events. One such event is the reading of Cecilia’s diary, which the voiceover tells us was found in the Lisbons’ bathroom by a plumber’s assistant named Skip Ortega who then tendered it to Parkie Denton. The scene begins with a pan across the floor of a bedroom belonging to one of the boys, upon which are scattered “souvenirs of the Lisbon girls” such as class photos, a bottle of nail polish, and the personalized invitations to the party thrown after Cecilia’s first suicide attempt. The shot ends on Cecilia’s diary, being opened for the first time by the boys. Already, in this single shot, the indexical and temporal registers are complicated; the movement of the shot from assorted tokens of the girls to the green, clothbound tome being intrusively handled by the boys follows the syntax of the narration (“Our collection of souvenirs of the Lisbon girls, which still exists, started with Cecilia’s diary,”) but directly contradicts its content, depicting the ensuing collection and the first contact with Cecilia’s diary as simultaneous rather than subsequent. In terms of story-time, these few seconds encompass a span of over twenty five years, as the narration broadens the moment to include the acquisition of the diary by Skip Ortega and its own retelling in the present day; later, as the boys read from the diary, the temporal frame expands further back, to include the events recounted by Cecilia in its pages. The boys are at first dismayed by the banality of Cecilia’s entries, the first of which are little more than descriptions of what she had for dinner (frozen pizza, creamed corn). Their disappointment prefigures the frustration that they will express later in the film at the impossibility of defining the Lisbon sisters through the material objects which they have accumulated; magazines, records, photographs — consumables of a different nature — will later prove just as exasperating and fruitless as dietary logs. Another of the boys grabs the diary, flipping forward several pages; “Mary chipped her tooth on the monkey bars,” he reads from it, boasting afterward, “I told you she had a capped tooth.” Here we see the genesis of the boys’ ongoing project, the evidentiary bias of their collection. The diary takes on true value to them only as a legend used to decipher the mythical Lisbon girls, one which most importantly confirms their own already held suspicions and theories. We can see throughout the film instances of images from the diary being used to design the half remembered, half imagined world of the Lisbons presented to the viewer. The first page to which the boys open includes, in addition to handwritten text, a cut-out and pasted image of a tree, and later Chase Buell remarks, “Elm trees. How many pages can you write about dying trees?” As we will see later, the elm trees which line the streets of their Michigan suburb play a significant role in the narrative, both for their representational alignment with Cecilia, as well as their greater resonances with the themes of the film. Elsewhere in the sequence, as the diary is being passed among the boys, we can clearly see a pasted photograph of a frog; in another scene, Cecilia, who has conspicuously little dialogue throughout the film, remarks to her mother that “the Brazilian Turbot Frog was added to the endangered species list today.” Three other entries are visible to the audience: a transcription of Lord Byron’s poem “When We Two Parted,” which has clear thematic parallels to the film (“They know not I knew thee…”); the name of Claude Monet, followed by the years of his birth and death and a brief description of his impressionistic techniques, which are evoked not only in the film’s pastel color palette, but also in its very construction of character and narrative from modular signifiers which become more diffuse the closer one looks at them; and a paragraph in which Cecilia expresses her affinity for the unicorn, a mythical creature which is then depicted in the second half of the diary sequence. As the boys struggle with the pronunciation of one of the names in the diary (“Lux lost it over Kevin… Hines?”) their voice is replaced by that of Cecilia in voiceover, who momentarily takes over the role of narrator, correcting them (“Lux lost it over Kevin Hanes…”). The image track switches from the boys in their room huddled around the diary to an amber-hued invocation of Cecilia’s impressionistic portraits of her sisters, alternately lazing and frolicking in wheat fields at dusk and holding sparklers up to the cerulean sky. A unicorn is seen, first by itself, then, after the voice of Cecilia is replaced by that of the narrator, superimposed optically upon a shot of Lux, implying that to the lovestruck boys, the fairest of the Lisbon sisters is every bit as mythical as the fabled unicorn. 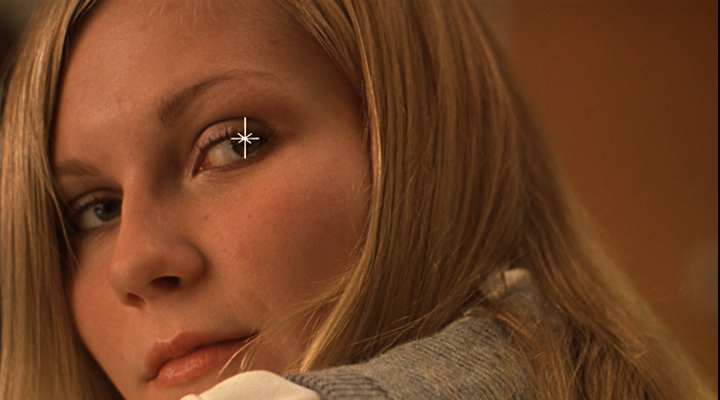 Lux, in closeup, looks directly into the camera (a visual motif repeated several times throughout the film, often with a dainty “sparkle” optically superimposed over her eye, accompanied by a gentle “ding” on the audio track) and we, the spectators, are absorbed into the “we” of the narrator, who continues, “And so we started to learn about their lives, coming to hold collective memories of times we hadn’t experienced,” a description which could just as easily apply to the act of cinematic spectatorship. There are pointedly no shots of the boys while Cecilia is narrating, the image track only returning us to their bedroom once the voice of the film’s narrator returns, as though the more the boys try to hold on to the girls’ memory, the further it recedes. The preceding sequence, however, in its trajectory from text (Cecilia’s handwritten pages) to voice (Cecilia as narrator) to sound/image (the heterogenous cinematic rendering of the world invoked by the narrating agency), is a direct microcosm of the discourse enacted by the narrator and, by extension, the film. 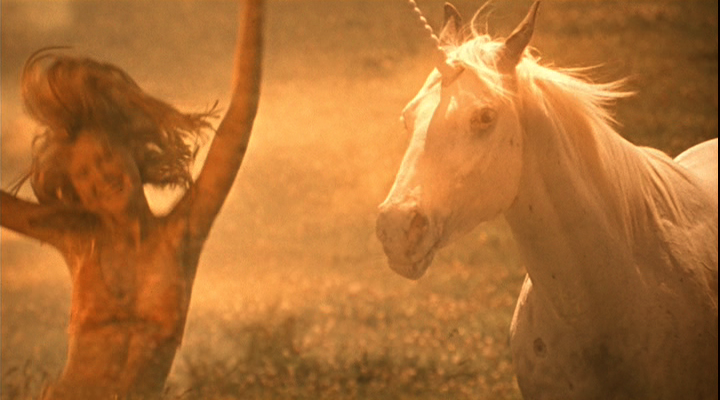 There are indexical referents, but the film itself must be understood as non-indexical, invoking the structuring elements and following the organizational logic of memory; embellishments may be present (the unicorn in the diary sequence, or later Cecilia sprawled in the branches of an elm tree, an image which has been often described as her ghost haunting the boys) and narrative time cannot be assumed to be literal or linear. One earlier sequence demonstrates a blending of temporal registers in a manner similar to that of the diary sequence’s first shot. Cecilia is shown pressing her palm print into the wet cement spackled over a hole in their dying elm, a singulative event. The shot continues uninterrupted, tracking left to follow her as she walks across the lawn and sits down next to Lux, who is wearing a bikini and reclining on a towel. As the voiceover informs us, however, “Almost every day, and even when she wasn’t keeping an eye on Cecilia, Lux would suntan on her towel wearing a swimsuit that caused the knife sharpener to give her a fifteen minute demonstration for free,” signaling the second half of the shot, as well as the subsequent reverse shot of the knife sharpener, as iterative. Other elements of the diary sequence’s narrative discourse resonate throughout the film, beginning with the first sequence. The Virgin Suicides opens with a series of shots which function as iterative or pseudo-iterative tableaux depicting an evocative, almost clichéd portrait of perceived suburban idyll: Lux eating a popsicle, a woman watering her lawn, two girls walking their dog, brothers practicing basketball in front of their garage, and sunlight filtering through the leafy elms. The lush, verdant trees are foregrounded in nearly every shot, and the sound of crickets and birds is prominent on the soundtrack. A shot of Parks Department workers nailing a removal notice to one of the trees, however, undercuts the manufactured illusion of the idyll, a juxtaposition which is mirrored on the audio track by the slow, faint introduction of a siren in the distance. Abruptly, the image switches from the ochre tones of the neighborhood to a cool blue closeup of perfume and makeup bottles strewn upon a windowsill later shown to be inside the Lisbons’ bathroom; the audio, concurrently, cuts from the gentle humming drone of the crickets to a slow staccato drip, like that of a leaky faucet. The narrator informs us that “Cecilia was the first to go,” as the image cuts to Cecilia floating in the bathtub, eyes open and body motionless in the pink, darkening water. This initial switch from pseudo-iterative to singulative is jarring, accompanied as it is by abrupt changes in the image and audio tracks, but there is still an ambiguity stemming from the fact that even though the narrator has told us that Cecilia was “the first to go,” and we have seen the aftermath of her suicide attempt, in the next short sequence Cecilia is alive. It is not until later in the film that we learn it is only upon her second attempt that Cecilia succeeds in ending her life. After the brief sequence of Cecilia in the hospital, the image returns to the Lisbons’ suburban street, tracking past the houses as though the camera/spectator were a passenger in a car driving down the tree-lined road. As the camera pans up toward the sun poking through the leaves and branches, the image dissolves to a blue cloud-speckled sky with the title superimposed in the cartoonishly ornamented handwriting of a young girl, hearts dotting the “i”s. Gradually, the title multiplies, appearing in approximately two dozen more varied handwritten fonts adorned with illustrations (including two of a unicorn), bringing to mind a high schooler’s notebook. This establishes the graphophilic undercurrent which runs throughout the film, most prominently in the boys’ obsession with Cecilia’s diary (“Emotional instability. Look at the ‘i’s, the dots on them — they’re everywhere,”) and fetishistic accumulation of notes, vinyl records branded with Lux’s signature on their cardboard jackets, and other handwritten ephemera. The technique is repeated later when the five Lisbon sisters are introduced individually, their handwritten names superimposed over freeze frames of them as they emerge from their parents’ car one by one. Here, the variety of handwriting styles suggests an indexical referent lending authority (the literal and figurative signature of the girls) to the narrator’s depiction (each sister presumably rendered by her own hand); the text’s status as temporally fixed, combined with the freezing of the pseudo-iterative image implies a desire to extract the girls from the momentum of time, to give their memory a fixity precluded by their premature deaths. At the same time, the effect highlights the artificiality of the cinematic signifier; written text, the photographic representation of the embodied girls in both moving and still image, the image of the tree’s leaves, extra-diegetic music, and the voice of the narrator combine in a manner that is unabashedly authored. 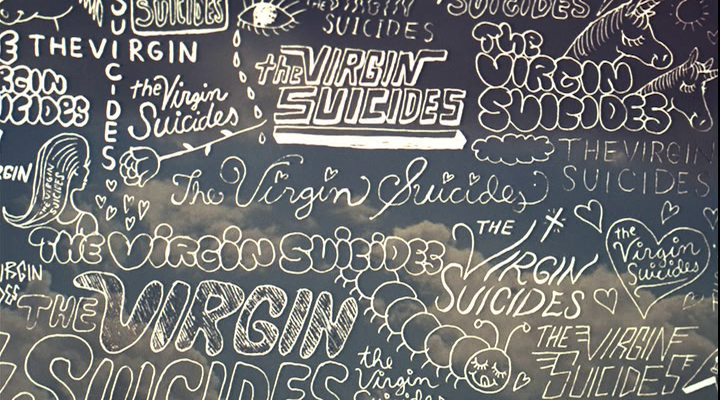 Meanwhile, the sheer volume of handwritings in the title card, which can be understood as suggesting the narrative’s manifold authorial contributors, highlights the first person plural narrator and his/their truth-in-numbers approach to accumulating and synthesizing evidentiary data into the form of a unified narrative. The first shot alone represents a pastiche of the images and tropes developed throughout the film and stemming both from the boys’ own sexualized impressions of the Lisbon sisters and from elements culled from Cecilia’s diary and other tokens and reminiscences collected by the boys in the years following the suicides. Lux, standing in the middle of the road, takes the last bite of a popsicle and then casually wanders out of frame. Debra Shostak identifies the opening shot as “immediately [singling] out Lux as the dominant sister,” whose “opening notes are blooming sexuality — her appetite, the phallic Popsicle stick she licks, her direct look into the camera — and elusiveness, as she disappears from view” (Shostak 186-187). 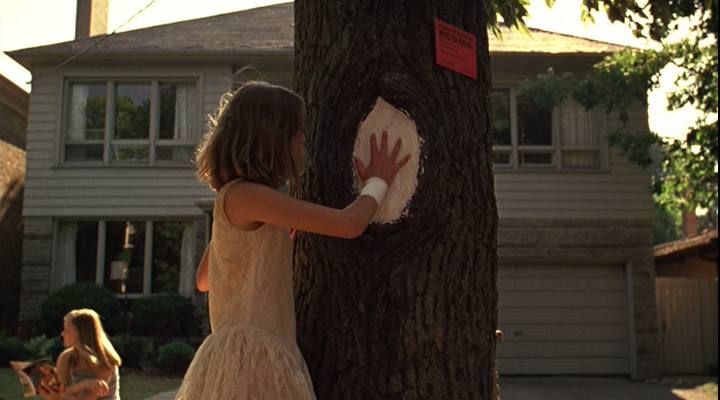 To this I would add, however, that the canopy of elms lining and covering the street (and not yet marked for removal) establishes one of the film’s strongest visual motifs, and the wooden popsicle stick, which Lux continues to hold up near her face even after she has denuded it of its colorful, sugary succulence, recalls the horn of the unicorn later depicted in Cecilia’s diary, thus establishing the narrative discourse as an act of myth-making as much as it is one of remembrance.